Today’s episode is a little pep talk for those of you who love to create, but who struggle with the idea of calling yourself an artist. This week, I’m chatting with painter Mya Bessette. Mya creates beautiful abstract landscapes, many of which are inspired by the nature around her home in Bigfork, Montana. I love how expansive and atmospheric Mya’s paintings are - some of them are more moody and mysterious, and others are bursting with light and color. Her joy and enthusiasm for art and creativity are totally contagious! While you’re listening, go check out her work on Instagram @myabessetteart. In this episode, Mya shares all about her work, inspiration, process, favorite art materials and more! In this episode, I’m talking about creating artwork in collections - how I define a collection, how I’ve used them to help me be more focused and productive in my art practice, plus some tips for getting started working in collections. 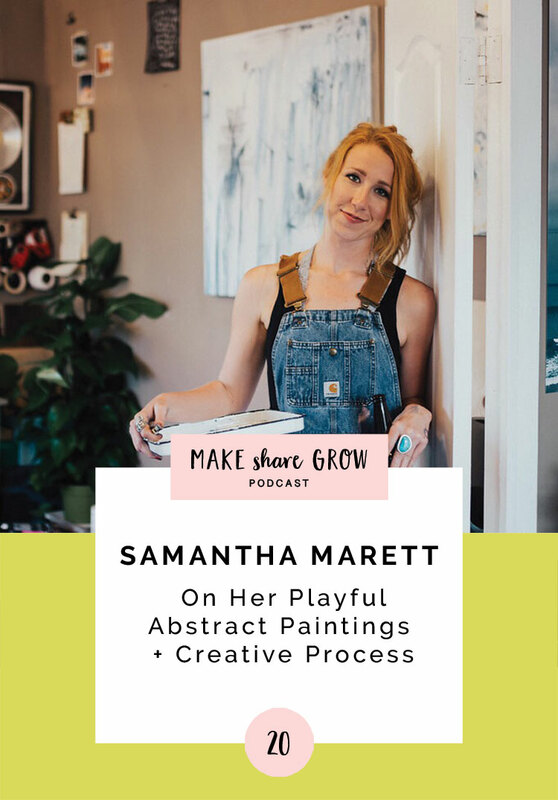 In this episode, Samantha shares all about her work, inspiration, process, favorite art materials and more! In this episode, I share how I plan out my studio time and get things done! I also talk about what is working the best for me and what systems I want to change and refine in the new year. 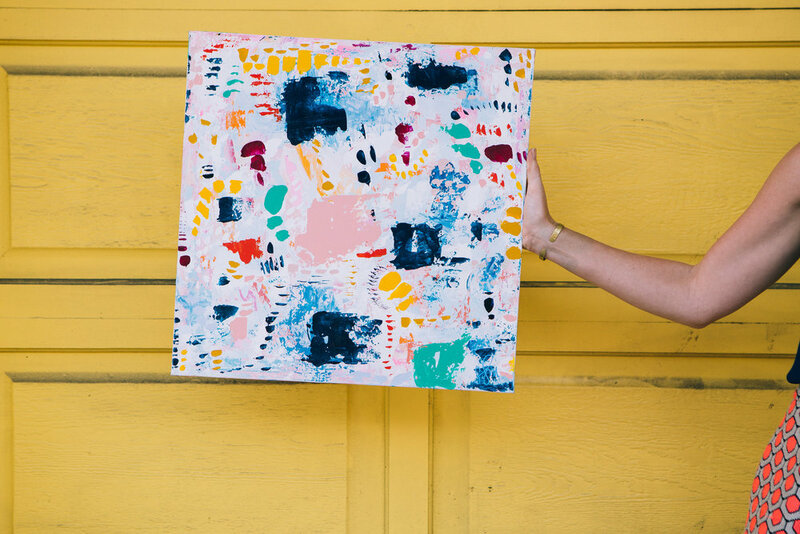 This week, I’m chatting with painter and surface pattern designer, Juliet Meeks. Juliet creates colorful, expressive floral paintings and patterns from her studio in New Orleans, Louisiana. She also shares her love of watercolor through several online painting classes on Skillshare. Her art is so energetic and joyful, and it always make me smile when a new painting of hers pops up in my Instagram feed. If you’re a color-lover like me, you will love following her work!! While you listen, hop over to Instagram and take a look - you can find Juliet @julietmeeksdesign. In this episode, Juliet shares all about her work, inspiration, process, favorite art materials and more! In this episode, I share five of the people, apps, podcasts and blogs that are inspiring me and helping me be more productive in my studio right now! This week, I’m chatting with painter Lysa Jordan. She works from her live-in studio space in Montreal, Canada, which sounds like a total dream! Lysa creates gorgeous, sweeping abstract paintings full of layers of color and movement. Her work evokes the rushing energy of nature as well as inner emotional landscapes. As you listen, do yourself a favor find Lysa’s art so you can get a better picture of what we’re talking about - you can find her on Instagram @lysajordan_. In this episode, Lysa shares all about her work, inspiration, process, favorite art materials and more! This week, I’m so excited to have my very first guest on the show! Kati Kleimola is a painter, a wife and a mom of 5 living in Toledo, Ohio. Her colorful work encompasses still life, landscapes, animals and more, but it’s her signature floral paintings that caught my eye when I discovered her work. While you’re listening, go check out her art so you can see what I mean- you can find her on Instagram @kati_kleimola. 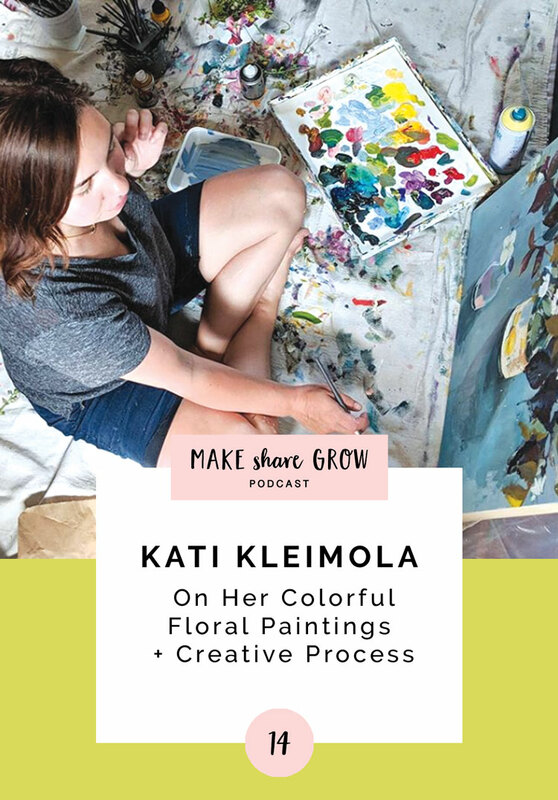 In this episode, Kati shares all about her work, inspiration, process, favorite art materials and more! Welcome to Season 2 of Make Share Grow! In this episode I share what’s in store for this season of the podcast, along with some of the current triumphs and struggles I’m going through in my art practice. This is the final episode of Season 1! 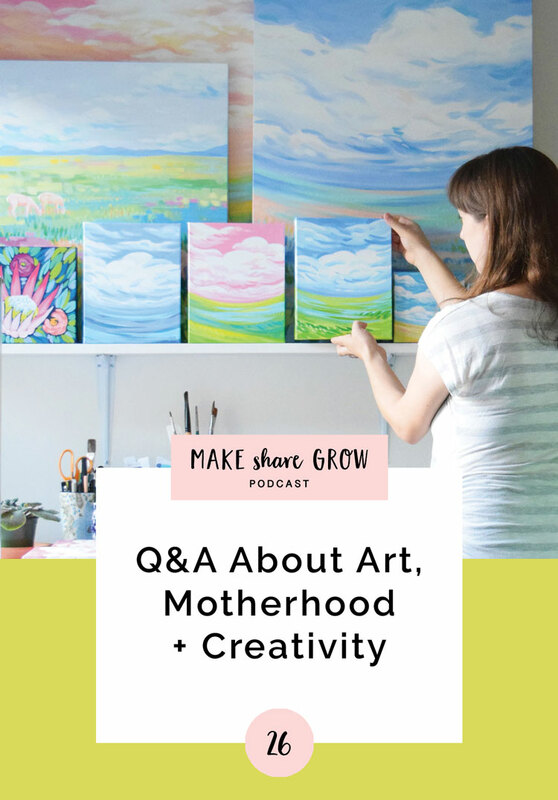 In this special Q&A show, I answer your questions about my art practice and business, from being a mom/artist, to keeping my acrylic paints from drying out, to using social media, and more! In this episode I share all about my process of creating a painting from start to finish. ’m excited to talk about this because I know every painter works very differently. We each have developed a process that fulfills our unique needs and personalities as painters, and most of the time we break a whole bunch of “art school” rules along the way! I hope this will be a fun look for you into how I create. 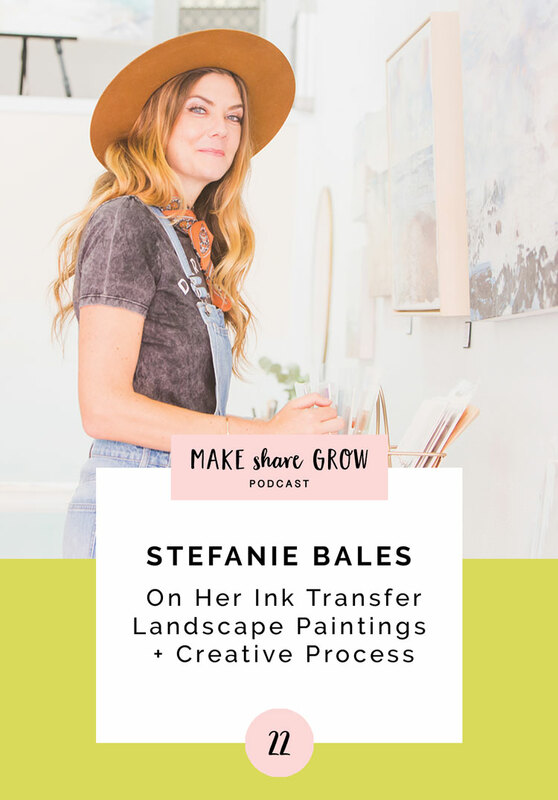 In this episode I share four lessons I’ve learned along my journey as a stay-at-home-mom who also has big dreams as a professional artist. 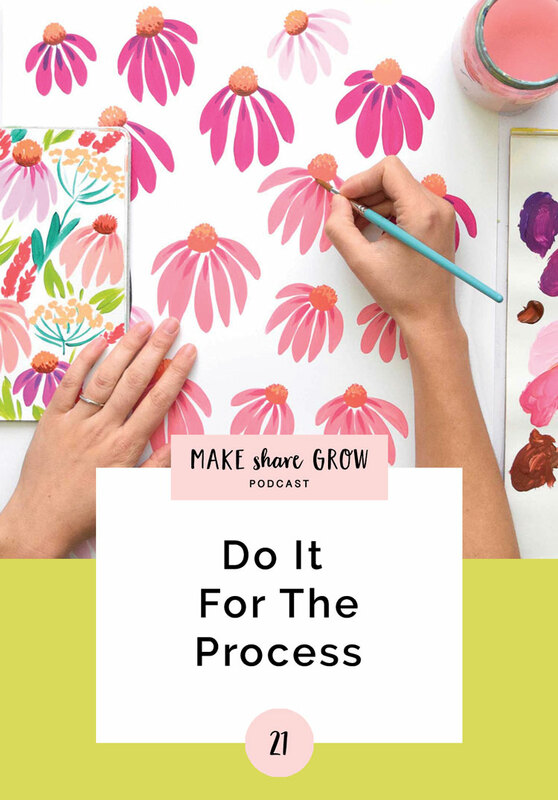 In this episode I share about how I’ve crafted my commission process: a specific series of steps that I walk through for each commission I take on. Crafting a system is a great way to build your confidence and expertise, as well as deliver a smooth experience for your client each and every time. If you’re interested in creating a system for commissions in your creative business, I’ve created a download for you with my 5 Steps for Crafting a Commission Process. Just enter your email below, and enjoy!! On its way to your inbox! Episode 8: Geeking out About Art Supplies! In this episode I’m talking all about my favorite art supplies that I use in my studio, from acrylic paints, to brushes and tools, to canvas and paper. Just as a warning, I get a bit deep into the details because I love geeking out over this stuff! If you’d like a written list with links to all the art supplies I share in this episode, I’ve created a download for you: The Master List of My Favorite Art Supplies. Just enter your email below, and enjoy!! This is the third and final episode of a three-part series about the things that inspire me to paint. I share how I discover colors that speak to me and how important the feeling of freedom is in my painting process.